My mom loves all animals. Dogs, cats, birds, snakes, rats. But today we're not focusing on the creepy animals that my mom loves so much known as snakes. 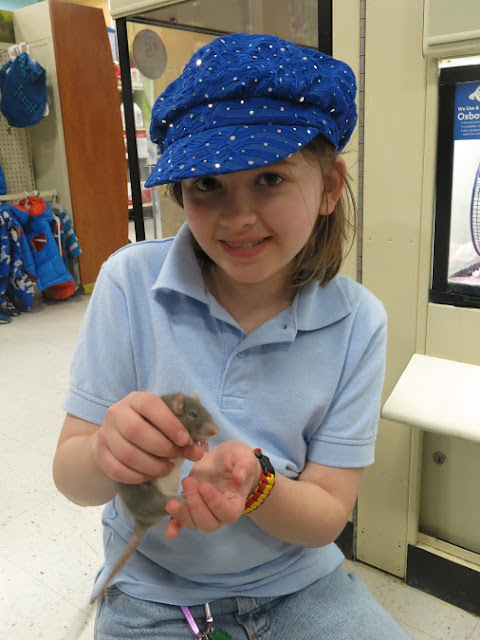 Here's a photo from a couple years ago of my mom loving on a rat at Petsmart! Notice all the fashionable doggy sweaters in the background...I'd love to be bundled up in one of those! And yes, I know it looks like the rat is being strangled but she's happy and comfortable. We don't think a rat would last long around here....just sayin'. Our mom went running out of the room! I saw naked rat at Petsmart once it didn't have no furs or nothing. I think your mom needs a needs a naked rat because she's probably the one who could love it. What a cute little guy (or girl)!! I've heard that rats are very intelligent and make good pets. Unfortunately, I'd probably take its squeaker out, and ask questions later.